Design isn’t just for designers. Develop the 21st century skills that will take your career to the next level. IIT Institute of Design’s MDM is a master's program for experienced professionals, both designers and non-designers. The MDM program will challenge you and accelerate your professional growth, regardless of where you’ve made your career. Plus, our popular part-time option allows you to take what you learn one evening in class to work the next day. Often students consider the MDM as a creative alternative to an MBA. The only design school in the US devoted completely to graduate students, ID offers a unique professional school experience. Design’s power is its position as a nexus point. That’s why at ID, we integrate other disciplines and domains—behavioral science, anthropology, ethnography, user research, communication, engineering—into our studies. And that’s why we encourage a vast array of professionals to pursue graduate study in design. Food scientists and marketing managers, human resource professionals and venture capitalists—all can benefit from learning design competencies, especially strategic thinking, and all can bring them to benefit their everyday work. We are known for our pioneering, human-centered approach to design. This—our human-centered design sequence—is the cornerstone, and only requirement of, our MDM program. For their remaining courses, students are encouraged to customize their own path at ID, mixing and matching according to their professional goals and interests. Most courses are seminar-based, with hands-on exercises regarding real-world challenges. Some courses are run as workshops with a focus on applying theory to resolve larger, more complex problems. Courses are either a full semester long (14 weeks) for 3.0 credits or one half a semester (7 weeks) for 1.5 credits. For professionals who are looking to be more fluent in the field of design, these courses cover the fundamental philosophy and principles of modern user-centered design practice. For professionals who are tasked with breaking down functional silos, these courses cover the methods and practices of interdisciplinary collaboration and innovation. 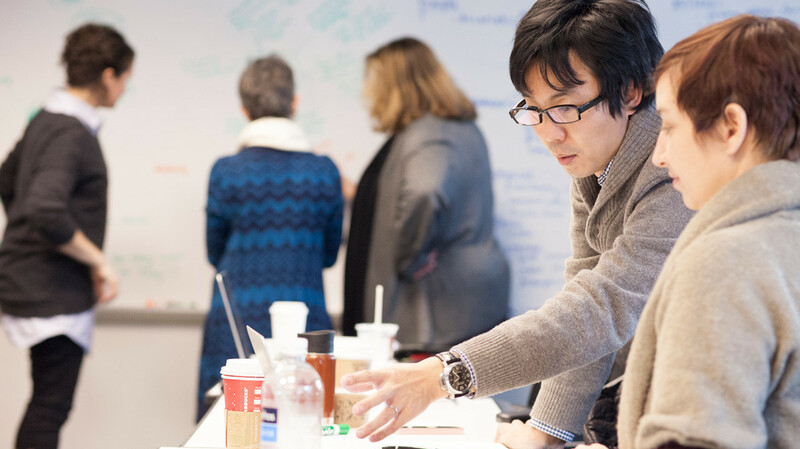 For professionals who are looking to enhance their ability to build or grow businesses, these courses explore how design contributes to creating new value in both established business and entrepreneurial contexts. For professionals interested in larger societal issues, these courses explore emerging design practices targeted at addressing socially oriented challenges. For professionals looking to better leverage the emerging world of data in their practice, these courses provide an introduction to data-oriented issues and emerging techniques in design. ID graduates have a greater than 95 percent placement rate and report high job satisfaction. Students come out of ID with lasting skills and the ability to apply design methodology to a wide range of challenges within large and small enterprises. ID alumni make up a strong network—a uniquely skilled set of more than 2,400 people across 32+ countries who deal with difficult issues and navigate them with clarity, purpose, and discipline. Our graduates create ideas, products, solutions that are not only new and original, but also effective and scalable in a variety of industries. And our humanistic approach makes social innovation and civic design a natural fit for our graduates, whose placement in the public and nonprofit sector increases every year. You will receive an email confirmation when all of your materials have been received. Admission decisions will be communicated roughly four weeks after this confirmation.